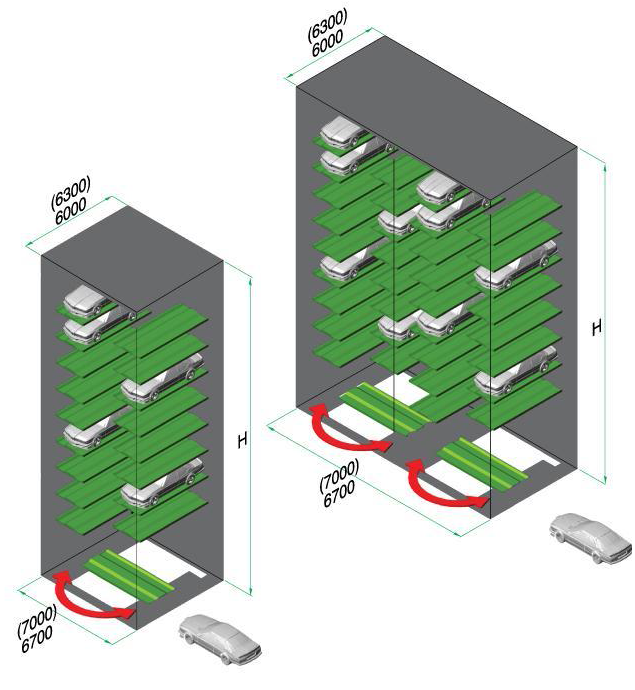 The Ryoko Lift Park permits space-saving parking by stacking vehicles above each other. 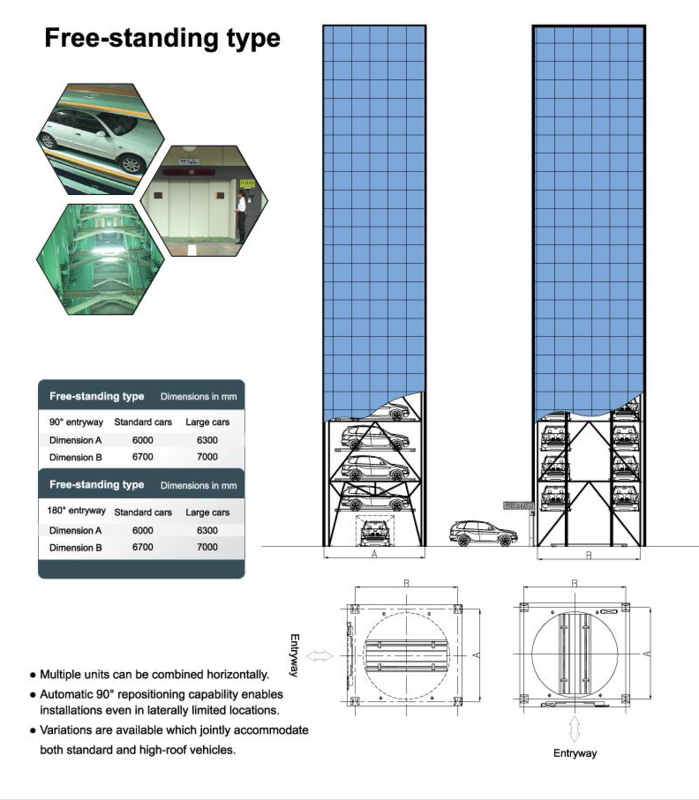 With a vertical lift it is possible to park up to 52 vehicles on a base area of only 37.8 squared meters in single rows. With multiple rows on a slightly larger area, as many as 78 vehicles can be accommodated. The automatically operated lift park makes ramps and aisles unnecessary, offers protection against theft and vandalism, saves on the expensive building technology compared with conventional buildings, and is environment-friendly in terms of its compact construction. With Ryoko Lift Park, vehicles are driven onto pallets, which are lifted individually at high speed, to their designated parking berths located on both sides of their lifter shaft. Once users disembark from the vehicles all operations are computer-controlled. Automation both assures the safety of all users and guarantees collision-free handling. A built-in turntable is provided to permit 90° vehicle rotation for narrow installations suited to sideways berthing. 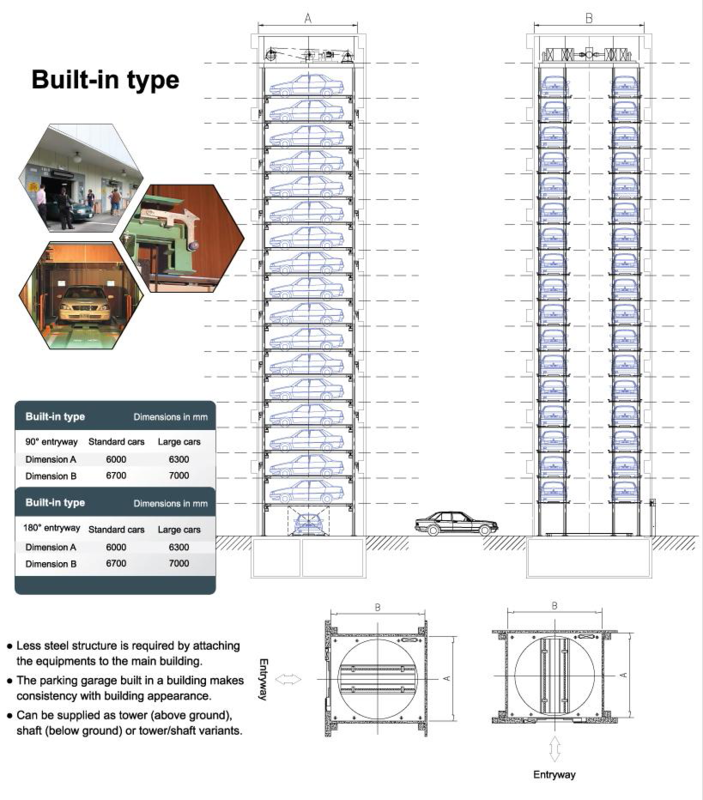 Since vehicle pallets move through the tower individually, Ryoko Lift Park is highly energy-efficient. It achieves noticeably faster parking and exiting, and generates minimum noise or vibration. Parking Indicators: instructions such as “Please hold on”, “Please Reverse”, “Please drive forward”, and “Please turn off the engine and pull the handbrake” are given both via voice broadcast and LED monitor to help drivers park onto the pallet properly. Personnel Detector: before the machine operates, personnel detector confirms that no one is in or around the pallet by using sound wave technology. Vehicle Size Monitor: Photoelectric detectors play the role of vehicle size monitors, indicating if the vehicle outstrips the limited figures. Messages such as “Over height/length, do not enter” are displayed on a LED monitor along with voice broadcast and alarm sound to warn the driver. Emergency Stop: the emergency stop button is a safety device which allows the operator to stop the machine in an emergency. Pallet Lock Device: the pallets are locked after loading vehicles to prevent the pallets from trembling and falling out. Flat Tire Prevention Device: these devices are placed in front of the pallet to prevent flat tires from occurring while vehicles are driving in. LED Message Board: information is given via the LED message board in the front door, such as “System is progressing”, “Please wait”, “Please enter” and many others in accordance with various operational conditions. CO2 Fire Extinguishing System: with respect to the fire protection facility, an automatic temperature detecting system is equipped inside the parking tower. When the system detects an unusual rise in temperature, the system will notify management immediately and alight with the main building fire protection system. For safety concern, the management shall confirm the situation and make sure to evacuate people inside the garage before starting the CO2 fire extinguishing system.